Is your bright child under-performing in school? Should you even worry about it? I was one of those people who did well in school without too much effort. My parents made it clear that straight A’s were expected and I willingly complied. It never occurred to me that my children might have trouble doing the same. They were clearly smart (identified as gifted). I was providing a highly enriched home environment (I practically made a career out of enrichment – in fact, now I actually do have a career focused on enrichment). This was, to borrow the title of a book written by my friend Rita Eichenstein, Not What I Expected as a parent. Of course the culprit was, to a large extent, my children’s learning disabilities. Their ADHD and dyslexia made it much harder for them than it had been for me – even though they’re smarter than I am. I got them the remediation they needed and found schools that were as good a fit as possible. Their grades improved. But I didn’t realize at the time how irrelevant that actually was, in many important respects. Academic achievement is not all it’s cracked up to be. Yes, it’s a measure (to some extent) of learning. And yes it can open doors to selective schools where your child might finally find the work (and their peers) to be interesting. But good grades are as much a measure of compliance, memorization skills, and the desire for extrinsic rewards as anything else. Compliance because to get a good grade a student must anticipate what their teacher wants and give it to them. They must behave well, not challenge their teacher’s authority, and not think outside the box. Be a “people-pleaser.” Dare I say a “teacher’s pet”? Memorization because we still have an educational system that bizarrely – in an age when data is available instantly with the swipe of a finger – insists that students memorize and regurgitate facts. Don’t schools realize we’re in the information age? A desire for competitive extrinsic rewards – a parent’s pleasure, a teacher’s kudos, the honor roll, valedictorian – drives the academically motivated student toward high grades. They learn to measure their achievements not by what they have learned, but by whether they got an A or an A-. I’ve seen the joy of learning dissipate in students who become extrinsically driven. 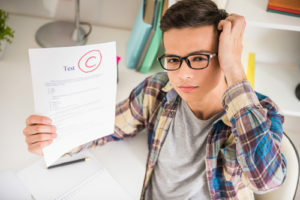 It’s no longer about what they find interesting, but what they need to do to get an A. There’s an interesting book called Doing School about this phenomenon in high-achieving high school students. Many people make the mistake of conflating giftedness and academic achievement. In my view, giftedness is about curiosity, and intellectual ability. Academic achievement is about rule-following, learning what you’re told to, and “playing the game.” Pretty different, right? The question I urge you to ask is: Do you really want your child to adopt the patterns of behavior required to be a straight A student? Does it help them achieve their goals? Does it help them grow into a fulfilled adult? I applaud Chet, and hope all children can maintain true genuineness of interest in learning.